Door opening 5'4" X 6'1"
Note: Trailer has a 50 mile radius repair clause. Inside 50 miles, we (Crown Rental) will take care of the issue. Outside of the 50 miles, you (renter) is responsible. Trailer is not for hauling logs, construction debris, yard waste (only bagged), rocks or mulch. 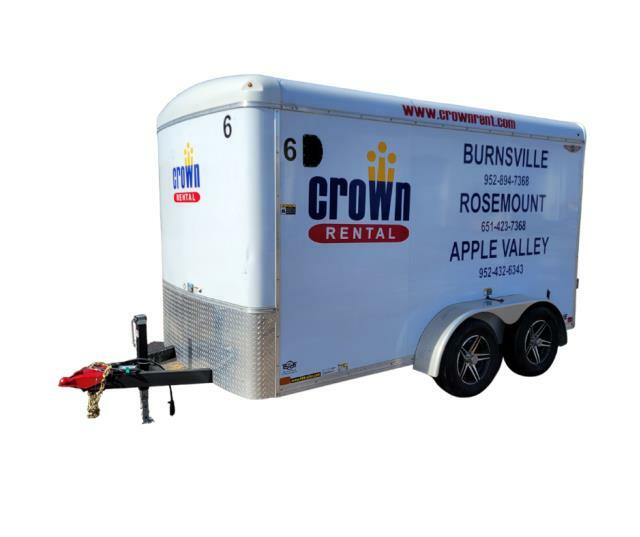 * Please call us with any questions about our trailer enclosed 12 ft 3500lb electric rentals in Burnsville MN, Rosemount MN, Apple Valley, Minneapolis, St Paul, Twin Cities, South Metro,and Dakota County.